An operating agreement is used by limited liability companies, or a LLC. Each state makes the legal requirement as to whether this document is needed. Many states do not require it. To know whether it is required in your state, check out the website maintained by the Secretary of State for your state. The operating agreement will detail how the business functions as an organization and how its finances are handled (including how profits and losses will be distributed). The agreement has some common provisions: a statement of intent, the purpose of the business, the time period during which the business will be operating, how it is taxed, LLC members (including how new members may be brought into the LLC), and the capital contributions of each member. You’ll learn more about the various components later on this page. The components used to create the operating agreement will depend on the tax structure of the business, the number of members involved with the LLC, how management is structured, how each member invested into the business, and how profits are shared. An operating agreement will also detail the duties, rights, and powers of the members and managers. It can also list ownership percentages for owners. This helps to protect the limited liability company from certain business liabilities. It also protects the individual members and managers. Having a written operating agreement offers better protection than verbal agreements. As you can see, the information within the agreement can be used for many purposes. It’s also well-suited for use as a reference tool for each of the members of the LLC. An LLC is a business structure that creates a limited liability company. LLC is an acronym used to refer to that particular business structure. The formation of an LLC takes place at the state level. You get the proper paperwork from the Secretary of State in your state or the state where you would like to incorporate. The documents completed to form an LLC are usually referred to as Articles of Incorporation. The completed documents, as well as the filing fee, are given to the state for filing. You would then receive a receipt and an acknowledgement that you now have an LLC. LLC documents are pretty easy to complete. You can do it yourself, hire an attorney, or partner with a company that completes these forms for others. Doing it on your own is much cheaper than using a lawyer or even a document completion company. LLCs are one of the most popular business entities. It creates a pass-through business model for finances. Also, while there are no direct tax benefits (outside of lower taxes with the latest tax reformation), the tax filing process is relatively simple since you would still use a 1040 and only add a couple of extra schedules. It’s also a popular business entity because there are fewer legal requirements to follow when compared with a standard corporation or partnership creation. The fee for renewal is also quite affordable each year. As you can probably imagine, the fewer members an LLC has, the easier it is to create an LLC operating agreement. 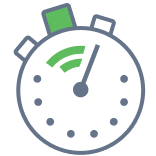 Create a free Operating Agreement in minutes with our professional document builder. Depending on where you’re forming your LLC, having an operating agreement may be required by state law. So, before you do anything else, check with the Secretary of State where your LLC is registered to determine if you have a legal obligation to create and maintain this document. You should also determine whether you need to put a copy of this document on file with the state. If you don’t have an agreement and you sue another member or another member sues you, the state laws would determine how the matter is handled. Every state has laws in place that govern LLCs (and business practices in general). If you have a written agreement that is signed, it would be used to interpret the matter provided that the agreement itself was void under contract law. It helps protect the concept of “limited liability.” Sure, the LLC itself provides some protections, but those protections are defined by state law. So, depending on the state, if you didn’t have an LLC agreement, you could find that you have more personal liability than you want (or expect), particularly if it looks more like you’re running a sole proprietorship or partnership than an LLC. Having a written agreement that explains how the business is operated, the amount each member contributed, and how profits and losses are shared can help every member understand the relationship. This can help minimize the number of disagreements and misunderstandings that happen between the members. If the LLC has more than one member, the agreement is just as valid as any other legally binding contract entered into between the members. With one member, you create a single member LLC operating agreement. With more than one member, you create a multiple member LLC operating agreement. There are also member-managed LLCs and manager-managed LLC. These are multiple member LLC operating agreement. With a member-managed version, every member has the authority to handle the day-to-day operations of the business. With a manager-managed LLC, a manager or a management team is named as the person or persons that run the day-to-day operations for the business. Before we get into the details of the provisions most commonly found in an LLC operating agreement, do remember that which provisions you use (or don’t use) will depend on your specific needs. For example, if you have a multiple member LLC operating agreement, you’ll then need to decide if it will be member-managed or manager-managed. If you have a single member LLC, you may need to just outline the way the business operates and how profits and losses are handled. Information about the LLC. This includes the name of the LLC, a description of the services offered, signing information for the LLC, and the office address. Information for each member. For every member, you must list their name and address, their membership class, the capital they contributed to the business, their ownership percentage, and how much of the profits and losses they receive. Now that we’ve looked at the basic LLC info and member info found in every LLC, let’s look at some of the basic provisions. Administration. Administration is the financial and managerial aspects of the LLC. This part of the operation agreement explains the account methods used, gives information on the annual financial report, and discusses other issues of financial solvency. You will also explain the LLC’s tax status. This is either a disregarded entity or a corporation. A disregarded entity means that you have an LLC that the IRS treats as a sole proprietorship. When you file your personal taxes, you also file your business taxes with the use of additional schedules with your 1040. In short, the LLC is not addressed separately from the owner. Most of the time, a disregarded entity is a single-member LLC. This is because a multiple-member LLC is taxed like a partnership. The other tax option is to be taxed as a corporation. The LLC is taxed at the company level. Each member will be responsible for paying income tax on any distribution they receive from the business. The purpose of the LLC. In this section, you’ll explain why the LLC was created. This provision is commonly referred to as the Statement of Purpose. However, most states do not require you to be highly specific about your purpose. You may be able to use a broad statement such as “The purpose of the LLC is to act and engage in lawful activities for which the LLC is organized in this state.” So, essentially, you’re telling the State and anyone who reviews your operating agreement that you’ve created the LLC to conduct lawful business activities. The principal place of business. Although your LLC may conduct business in more than one city or state (or maybe even internationally! ), your LLC operating agreement must list the principal place of business. This is the main location where business operations occur. It could be office space that you lease or own. You could use a virtual office location. If you work from home, you could use your home address (or perhaps a PO box depending on state law). Minutes of meetings. (This may also include names of members who attended, votes or decisions made, and any other information that could be helpful to reference in the official record. Income tax returns (both state and federal). Business bank account deposit slips. Credit card statements for the business. Invoices or copies of invoices for your business. Bills that you’ve paid for your business. Three years of financial records and contracts. What the LLC does with its profits and losses. Explaining how the LLC handles profits and losses will depend on how it is taxed. For LLCs that are disregarded entities (meaning, they are taxed as a sole proprietorship), a year end report is created to show revenue and expenses. Revenue and expenses are record on Schedule C (Profit or Loss from Business) and reported via 1040 on the federal return. However, there are some revenues and expenses that will go on Schedule E or F. Many times, a loss can be deducted from the individual’s income. This can help with lowering the tax burden. For LLCs that are taxed as partnerships, a year-end report is created to show revenue and expenses. It also shows the capital accounts for all members of the LLC. This includes loans made to the business, equity contributions, and capital distributions. This document should also include each member’s percentage of ownership interest. It’s important that multiple-member LLCs have all the information to create this document no later than December 31 so that losses and profit may be properly given. You’ll use IRS Form 1065 for the business. Profits and losses are passed on to the members. The 1065 tells the IRS the amount that are given to the members so that the IRS knows what it should expect in tax payments. A Schedule K1 must also be created and used. Every member should receive a copy of the K1 so that they may properly report the profits and losses on their individual tax returns. For LLCs taxed as a corporation, you will first generate the fiscal year end report. You can serve a fiscal year end for any month, but you must file your return by the 15th day of the third month after the end of the chosen tax year. For example, if you choose to end your fiscal year in June, you’ll need to file your taxes by September 15th of that year. You’ll use Form 1120, which the US Corporation Income Tax Return to report profits and losses. You may also need to generate a Schedule K1 to give to members so that they may report their share of the profits and losses. How the LLC makes its distributions. You will explain how distributions occur. Generally, this is either as tax income / loss (distributions) or money actually paid from the LLC to the member. What the members and managers have the power to do within the LLC. You will explain what members can and cannot do within the LLC and what managers can and cannot do within the LLC. Remember, there is a difference between member-managed and manager-managed. A single member LLC can hire an external manager for the company. Assignment of rights of the members. The assignment of rights carefully defines the rights that the members of the LLC have. The terms of the LLC. These are the rules under which the members will interact as an LLC. Voting rights for the members. Voting rights are given to the members to help make decisions. Voting rights generally relate to the ownership percentage that a member has. How votes are given should be clearly defined in the operating agreement. The operating agreement should also specify the type of voting rights that the members have. For example, one type (as we mentioned) gives voting power that is related to how much of the business the person owns. The other way votes may be used is that each member gets one vote regardless of ownership amounts. The name and address of the registered agent. An LLC must have a registered agent. A registered agent is someone who receives notices on behalf of the business. 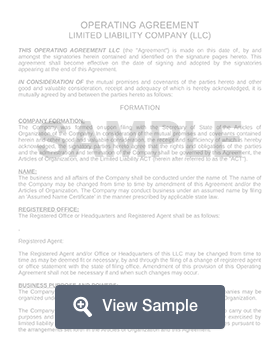 The operating agreement should list the name and mailing address of the registered agent. Whether a member can voluntarily leave the LLC. The operating agreement must explain whether a member may voluntarily withdraw their interest from the business and how it may be done. Check with the state where the business is registered to determine if you must use a certain form or document for a voluntary withdrawal. How the LLC will be managed. You should explain whether the LLC is member-managed or manager-managed. Remember that even a single-member LLC can hire a manager who is not a member to handle the operations of the business. Other common provisions include how new members may be brought into the LLC, transfer of interest from the LLC, capital contributions, additional capital contributions, what will happen if a member passes away, and how the LLC may be dissolved. With dissolution, you should check with the state where the business is registered because they may have certain forms that you must complete for the dissolution. Because an operating agreement is essentially a legally binding contract between the members of an LLC, it’s important that you keep in mind both the state where it was drafted (and where it will be governed) as well as whether signing the document is in your best interest. If you have questions about the terms and whether they are fair, you should make an appointment to speak with a business lawyer or a contract lawyer who can answer your questions. Can Members Amend or Change the Terms in an Operating Agreement? One of the most common questions asked about operating agreements is whether the terms can be changed. The answer is yes. The terms of an operating agreement may be changed if all of the members agree and signs a document that contains the changes (known as amendments).